Signed an AHL contract with Charlotte on 6/1/18. 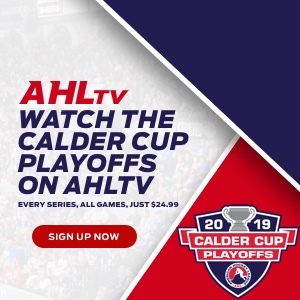 Spent the entirety of his first professional season at the AHL level with the Checkers … Scored the game-winning goal on the power play in his AHL/professional debut vs. BRI (10/14) … Scored the go-ahead goal on the power play in the third period of an eventual 6-4 win at TOR (10/22) … Picked up an assist at SYR (11/11), extending his point streak to a season-long three games (1g, 2a) and giving him six points (3g, 3a) in his first eight games of the season … Scored his second game-winning goal of the season at BNG (12/9). Totaled 130 points (69g, 61a) in 141 games over four seasons at Ohio State University … Served as team captain his junior and senior years … Led the Buckeyes and ranked third in the nation in goals as a senior … Named to Big-10 Second All-Star Team during his junior and senior seasons … Named to conference All-Rookie Team during his freshman year. Totaled 107 points (48g, 59a) in 118 games over two USHL seasons with Green Bay … Helped lead the Gamblers to a Clark Cup in 2014.